Hearing loss is a challenge that individuals of every age struggle with. It is the third most common health problem in the United States. This highly treatable health problem is often not found early, thus causing the person to struggle longer than necessary. Getting regular screenings is an important part of your health, especially as you get older. 25% of adults between the ages of 65-74 report disabling hearing loss and 15% of adults over the age of 18 have trouble hearing. You may not notice at first that you’re struggling with hearing loss, but if you find yourself feeling like people are mumbling or are often asking them to repeat themselves this may be a sign that you are not able to hear as well as you used to. If you find yourself avoiding restaurants or crowded places because you’re finding it challenging to hear the people you’re with or those you’re interacting with, this could be a sign that you’re having trouble with your hearing. Another thing to pay attention to is if you are hearing any random sounds. Whether you’re noticing ringing or buzzing, it may be a sign that you need a check-up with an audiologist to make sure your ears and hearing are still in good health. What can you do to prevent this hearing loss? There are several strategies that you may want to use. Start by limiting noise-exposure. Turning down the volume on your music or being cognizant of how often you’re visiting places that are noisy, like concerts or sporting events. When you are going to be exposed to loud sounds, ensuring you are wearing proper ear protection can assist in making sure you’re protecting your ears and preventing damage. 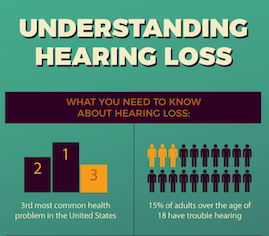 Our infographic explains some simple facts about hearing loss. Download it here, and don’t forget to schedule a screening with Northwest Primary Care’s audiologist here.